Hello and welcome to the 6th edition of the #brandwatchtips series. Brit is back to talk you through sentiment analysis – the tool that allows you to slice the noise surrounding your brand into clean, distinguishable, positive, negative and neutral segments. This video explains how to quickly answer some important questions about your brand like; is the sentiment surrounding the brand positive, are customers happy, is there an emerging negative story? All in all, sentiment analysis is brilliant at finding the views and feelings behind almost anything. For example, how British Citizens felt about the news Prince William and Kate are expecting a second baby. 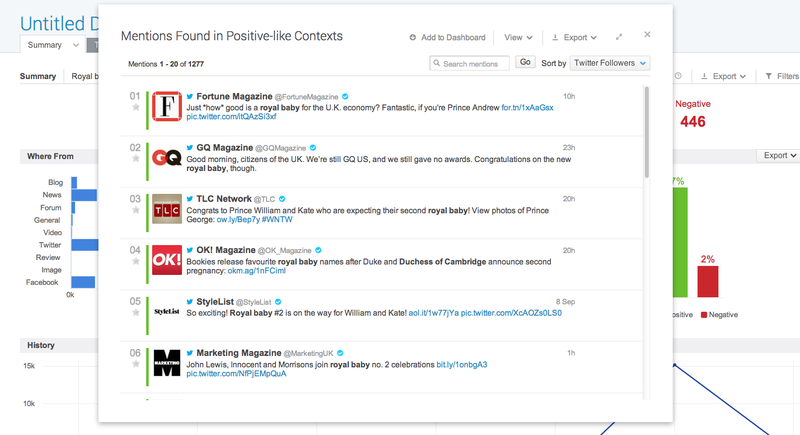 Once you’ve set up your query, you’ll immediately be able to see the overall sentiment about the topic in the summary dashboard (for the Royal Baby in this case). To dig deeper into this data, click on the positive or negative sentiment bars to show the individual mentions. From there you can sort the mentions by Twitter followers, site visitors, forum posts, blog comments, and chronologically. Sentiment analysis is extremely useful at gaging the current views and opinions on a topic, however, it can also be used to track the long term sentiment surrounding a particular topic or issue. Monitoring this can show the relative importance and significance of a specific event. Here we can see how the sentiment surrounding the English Royal Family has changed over time. It also shows the importance of the Royal baby announcement – it raised six times more positive mentions then the previous months average. You can program Brandwatch to alert you when a certain type of mention increases dramatically. For example, if negative comments about your brands rise by 75%. No sentiment system can ever be 100% accurate. For example, if you’re a funeral director, chances are your customers may be talking about death and bereavement. Ordinarily, these are likely to be classed as negative by our classifiers, but in this context they may be neutral as they are not negative towards the brand. You can set up Rules that will amend the sentiment of your mentions as they come in, according to those words that are typically misclassified for your context, meaning you can ensure you get a degree of sentiment accuracy that you are happy with. Our sentiment analysis is based on a library of hundreds of rules, which are used to define whether a mention of your search term(s) is positive or negative in tone. This is not as simple as merely a list of ‘good’ and ‘bad’ words. Instead, it takes into account a constantly evolving list of words, sentences and phrases to calculate whether a tweet is positive, negative or neutral. Sentiment is just one of the many brilliant features available with Brandwatch Analytics. To find out more, check out the #brandwatchtips playlist or request a demo with us. See you next Thursday for some more #brandwatchtips!